Editor’s note. This appears on page one of the April digital edition National Right to Life News. Since this is Patriot’s Day, this story seems particularly apropos to post. Please read the entirety of the 40-page issue and forward stories to your pro-life friends and family. As a young girl living in Massachusetts, my family and I frequented Lexington and Concord where the first battles of the Revolutionary War began. We learned about Ralph Waldo Emerson, who penned the famous words “the shot heard round the world” in reference to that April 19, 1775 day. A different kind of public outcry—shock—has begun in response to the absolutist abortion positions taken by prominent Democrats. The first shock took place on January 22, 2019, when New York Gov. Andrew Cuomo signed and celebrated the “Reproductive Health Act” (aka the Abortion Without Limits Until Birth and Beyond Act). Soon afterwards, Virginia Del. Kathy Tran calmly and emotionlessly admitted her bill would allow abortions up through all “40 weeks.” Soon afterwards Virginia Governor Ralph Northam said it was acceptable for doctors to allow abortion survivors to go untreated—infanticide. Together with other radically anti-life proposals by state and congressional Democrats, it has been the “shock heard round the world.” Pro-abortion Democrats finally publicly admitted what we’ve known for decades: they support all abortion – for any reason – even on healthy mothers of healthy babies, through the entire pregnancy. But there’s more! If the child actually survives the brutal attack on their tiny little bodies – abortionists refer to that as the “dreaded complication” – Democrats don’t even want to provide the kind of medical care to that living born child that doctors would for any other baby born at a similar gestational age. The past weeks have been a whirlwind of activity on abortion’s front lines. While much of the “mainstream media” remains silent, social media is blowing up. If you are not already, be sure to following National Right to Life on Twitter, Facebook and Instagram. The response to pro-abortion extremism is new legislation, rallies, and intense interest in making a difference for life. More than ever people realize they must speak up for those who cannot speak for themselves. 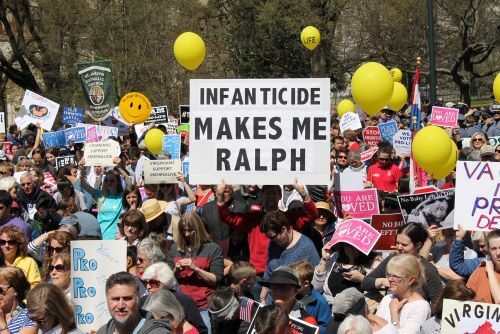 Just this past week, more than 6,500 pro-life Virginians rallied at their state capitol in Richmond in support of life. They were stunned to learn how close their legislature came to passing a New York-style abortion-on-demand law in their state. We are in a different battle than we were in 1776 – but we’re in a battle, nonetheless. We’re in a battle for the hearts of Americans, and the lives of precious unborn children. This time, however, the battle won’t be fought with muskets, but by telling the truth on social media, educating our communities, holding legislators accountable, and finally, voting at the ballot box. For example, on February 25, 2019, 44 pro-abortion Democrat U.S. Senators voted to block the Born-Alive Abortion Survivors Protection Act from coming to a vote. Be sure your friends know how their Senators voted on the Born-Alive Abortion Survivors Protection Act. The Born-Alive Abortion Survivors Protection Act would require nothing more than that abortionists provide the same level of care to a baby who survives abortion as they would to any other baby at the same gestational age. Meanwhile House Democrats have erected a procedural hurtle which prevents the bill from being heard. So far, 29 times Democrat leadership in the U.S. House of Representatives has refused to allow the bill to get to the floor for a vote. Abortion advocates would have you believe that somehow caring for born-alive babies is an infringement of “abortion rights.” But these living, breathing babies are no longer in the womb. Jennifer Popik, J.D., director of federal legislation for National Right to Life, is urging House members to sign on to a “discharge petition” to force the protective, lifesaving Born-Alive legislation to a vote on the floor of the House. The discharge petition is a procedural tactic to circumvent the Speaker of the House when the Speaker opposes a measure. It allows 218 House members (a majority) to force a floor vote on a bill, even if pro-abortion leaders oppose the measure. Currently, 198 Congressmen and Congresswomen have signed the discharge petition. We need 20 more. To encourage your Congressman or Congresswoman to sign the discharge petition for H.R. 962, the Born-Alive Abortion Survivors Protection Act, click here: http://cqrcengage.com/nrlc/action. Pay attention now to their actions, and pledge to hold them accountable in their next election. In this battle over life and death, we must be diligent. If they vote against protecting the babies, you can send a strong message. You can vote against them at the ballot box. Find their voting records at the NRL Legislative Action Center at http://cqrcengage.com/nrlc/scorecard.